Please contact owner Larry at 757-650-seven nine two six. 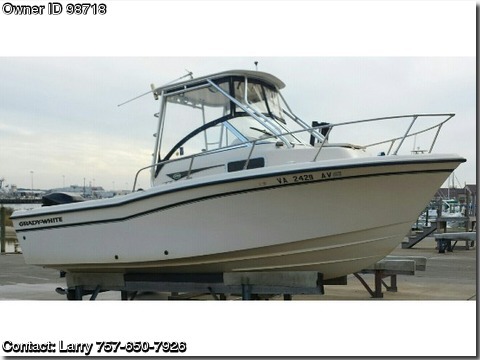 Boat is located in Virginia Beach, Virginia.1999 Grady-White Adventure 208,1999 Grady White Adventure Walk Around 208 -Excellent condition Loaded with options including the following Powered by 2000 Mercury OptiMax Bluewater Series 200 HP two stroke Custom Capps Boatworks Hardtop with rod holders, front and side curtains Lee outriggers Stainless Steel prop Cuddy cabin cushions are in perfect condition have not been stored in boat Boat has always been kept in dry storage Fresh Water Shower Bilge Pump Brand new throttle Transferrable Sea Tow membership-valid through 07172015 Dual Battery switch with two batteries Portable Toilet GPSFish finder Bennett Trim tabs Raw Water wash down Molded in live well and fish box Cushions are in excellent condition Newer hydraulic steering system Anchors, life jackets and other safety equipmentitems convey. NO TRAILER INCLUDED AS BOAT HAS ALWAYS BEEN IN DRY STORAGE.